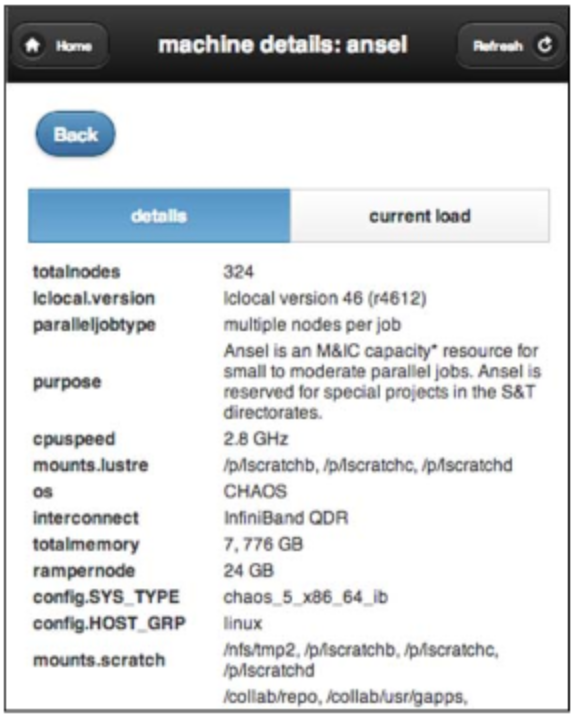 MyLC, the Web-based high performance computing portal for Livermore Computing (LC), has been enhanced since its initial release last year. For regular users of MyLC, the enhancements are highlighted below, and for those who have not used MyLC, the information herein serves as an introduction. LC users can access the MyLC dashboard via their Web browser. URLs and authentication methods are provided below. (or enter mylc in your broswer's URL bar) Use your LC user name and RSA OTP for connecting to the web server. Note: Entering mylc in the browser url is only available from onsite or via VPN. From offsite, accessing rzmylc using the keyword and full URL is only available via VPN. MyLC Mobile is optimized to provide the same high quality and intuitive user experience, thus providing access to some of the most useful portlets in smaller displays with no loss of performance. To begin, simply visit the MyLC dashboard in the normal fashion (see URLs and authentication methods above). The application will automatically detect that you are on a mobile device and redirect you as necessary. You can also reach MyLC Mobile directly from the URLs provided below. Example screen shots of the new mobile interface are shown below. In an effort to reach the widest audience possible, MyLC now supports Internet Explorer versions 8 and above in addition to the other currently supported browsers (Firefox, Chrome, and Safari). If you are still using IE7 or lower, you will get an error message when trying to access the site. 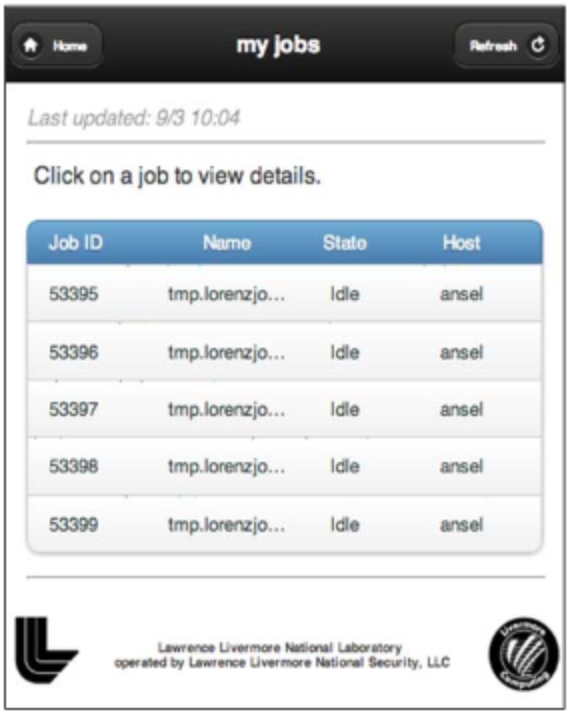 The addition of the Job Management interface allows you to submit, monitor, and interact with your batch (SLURM and Moab) jobs. The intuitive interface supports some of the most common types of job operations: cancel, get details, hold/unhold, send signal, etc. Additionally, you can see any completed jobs you may have run in the past. The images below show windows of the Job Management interface, one for creating new jobs and one for monitoring existing ("active") jobs. 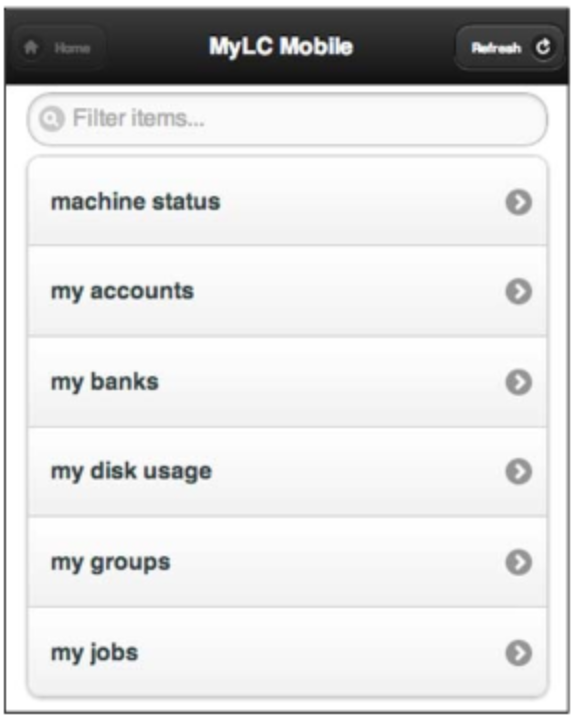 Job Management is available by selecting the "job management" tab in MyLC's main navigation menu. Information about several new portlets added to the MyLC dashboard is provided below. 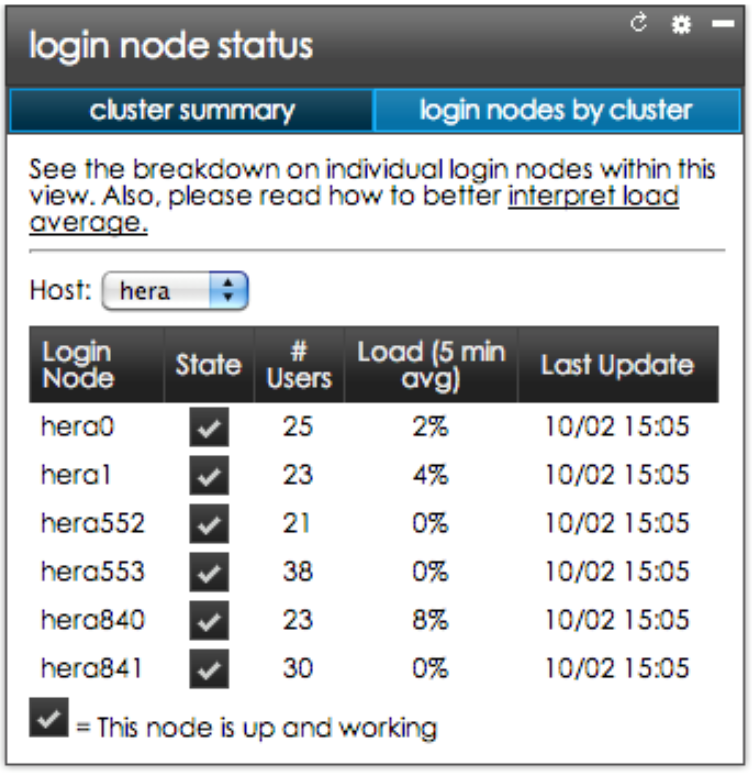 The "my processes" portlet allows you to see all of your processes that are running across a cluster's login nodes. 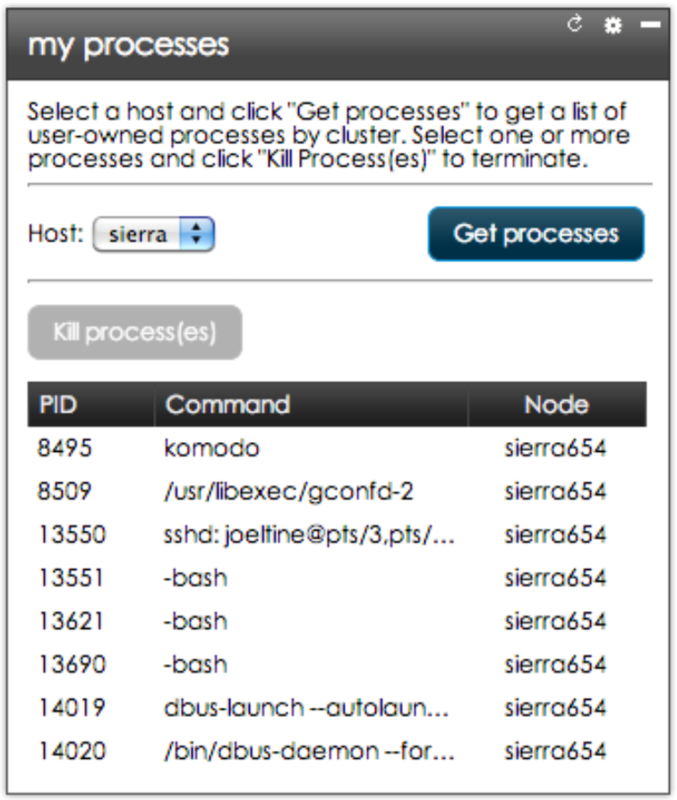 You can also kill these processes with the click of the "Kill process(es)" button. 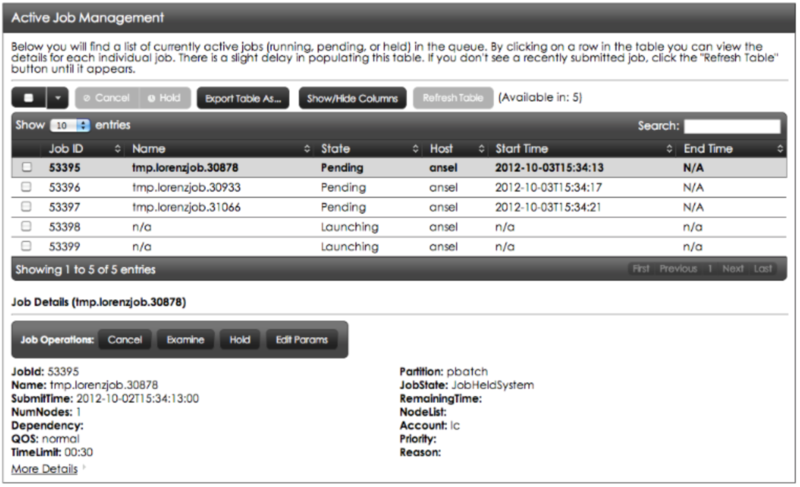 The "login node status" portlet displays the load on individual login nodes. 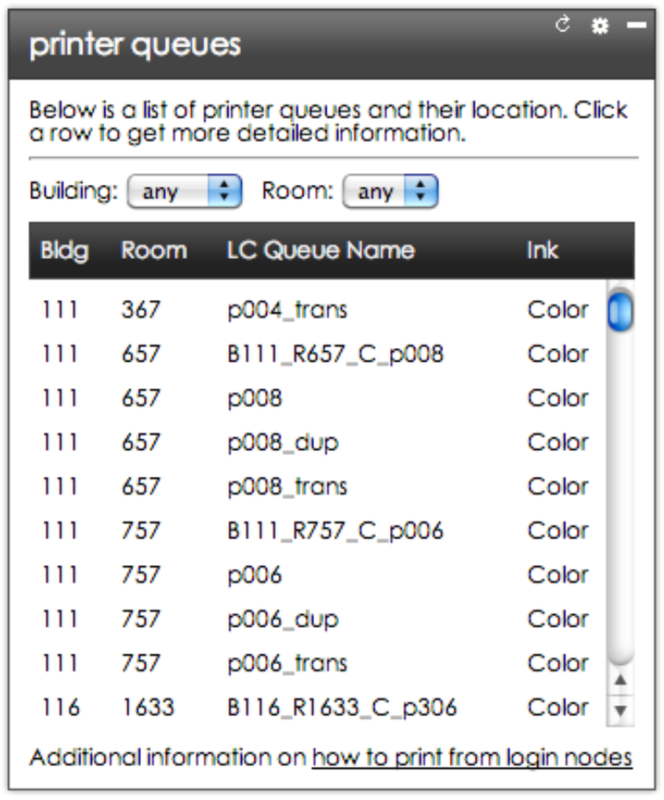 The "printer queues" portlet shows you all LC managed printers regardless of building location. This is useful if you're unaware of available printing resources. The LC File Transfer utility is under the MyLC “utilities” tab. 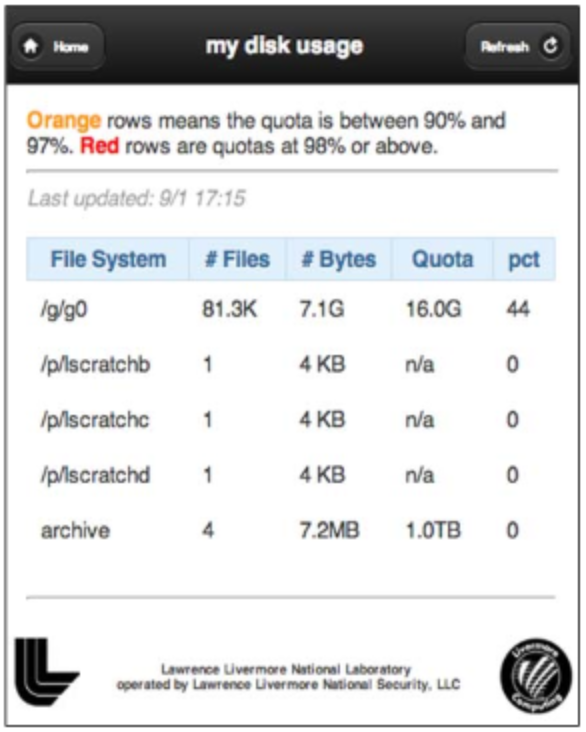 With this robust tool you can browse all LC file systems to which you have access. The file browser behaves similarly to what users would experience using Windows explorer or Mac finder. You can copy, cut, paste, download, rename, delete, create files/directories, and more. Perhaps one of the most useful features of the file transfer utility is the ability to upload files to remote machines from your desktop. Access to archival storage is also available. 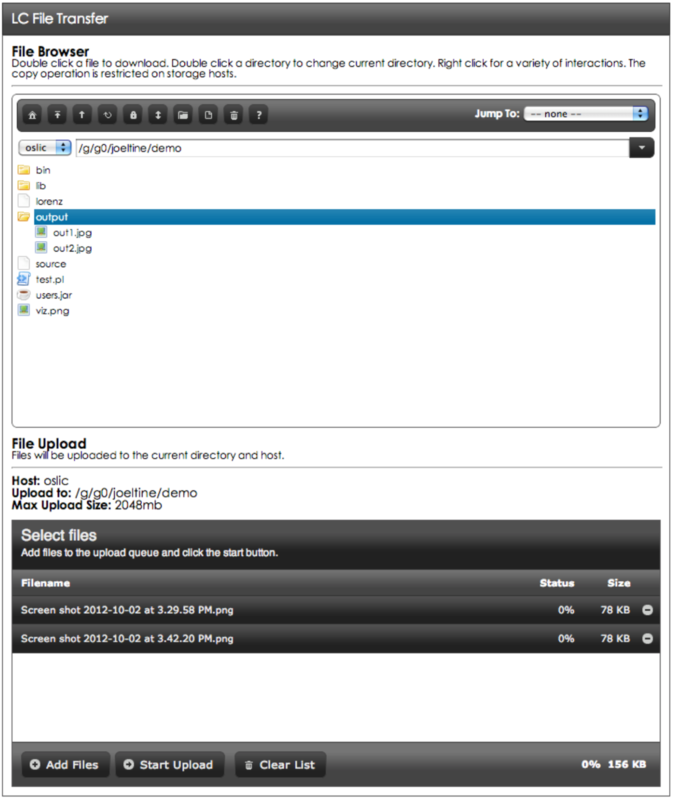 A screenshot of the LC File Transfer utility is shown below. PDF of TB476 for download and distribution.